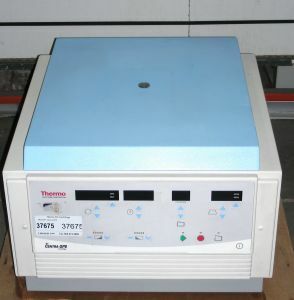 Product Description This Thermo IEC Centra GP8 centrifuge provides the powerful, large-capacity 4 x 750mL performance of floor model centrifuges in a compact benchtop design. Large suction feet secure each unit to the bench to ensure stability. Easy-to-clean, glove-friendly membrane touch panel with advanced SmartSet controls, simplify the selection of operating parameters. The panel features digital display of speed/g-force, run time, program number, rotor/radius setting, and temperature. Plus, you can replicate runs exactly with a single touch of a button. Speed can be set from 500 to 5300rpm in 10 or 100rpm increments. Or you can enter the required g-force, and the unit will automatically calculate the appropriate speed for you. Run time can be set up to 5 minutes in 1-sec. increments and from 5 to 360 minutes in 1-min. increments. When setting run time, you can also select a timing mode: either At-Start, which begins countdown when the START button is pushed, or At-Speed, which delays countdown until rotor reaches operating speed. You can also choose the HOLD position for indefinite runs in which time counts up until you manually stop the run. The program control lets you recall run parameters from memory at the touch of a button. You can store and lock up to 35 programs in the unit's internal memory. The rotor/radius control lets you enter either the rotor you are using (from a menu of all the possible rotors by IEC number) or the radius based on the rotor/accessory combination you are running. The Centra-GP8 offers five acceleration and braking rates (plus a coast position) which can be used to optimize runs: fast for rapid separation, gentle for delicate samples. A fail-safe cover interlock system prevents operation of the centrifuge while the cover is open and releases only at the completion of a run. Imbalance sensors terminate runs at low speed and signal operator to rebalance load. A variety of operator error messages and self-diagnostic codes are available to speed problem solving and minimize downtime. Rugged all-metal housing, cover, and containment ring system. Centra-GP8 also accept rotors from IEC Model Centra-7 and Centra-8 centrifuges. 3) what speed you intend to spin at? Swinging bucket rotors tend to have have limited speeds at which they are to be operated at and Fixed Angle rotors are generally used for higher speeds.